A homeless man is ignored by pedestrians on 6th street. There must be a shortage of tiki torches because Trump supporters have now turned to burning Nike products. The cause for this? Nike released a new commercial featuring Colin Kaepernick. He doesn’t mention Trump, he doesn’t mention protesting the national anthem and he doesn’t mention leaving the NFL. It’s an inspirational ad urging athletes, young and old, to pursue their passions and to not give up. However, just including and paying Kaepernick for this commercial is going to spark controversy after protesting the national anthem. The same thing happens when any other public figure in the middle of a controversy is featured in a film, television show or commercial. Take Johnny Depp for example. He is going to be featured in the upcoming “Fantastic Beast” films, something that has earned mixed responses from longtime fans of the Harry Potter franchise. However, these responses are justifiable since Depp did something that was actually bad. Physically and emotionally abusing your wife is much worse than taking a knee for the national anthem. But that’s another issue I don’t want to get to deep into. What I will focus on, is the hypocrisy behind the burning of Nike products. It’s pretty hilarious watching people destroy products they paid money for, considering that they’re basically burning their wallets. But aside from that, one of the main reasons Trump supporters are against Kaepernick is because they believe his protest disrespects veterans. This of course is false. The reason for Kaepernick’s protest of the anthem is solely because of racial injustice experienced within this country, not because he hates veterans. Now, considering Trump supporters are so eager to defend veterans from Kaepernick, you think they’d do more to aid them. So… why are you burning Nike products when you could donate them to homeless veterans who need them most? According to the U.S. Department of Housing and Urban Development the number of homeless veterans increased by 585 people between 2016 and 2017. The same data reveals that on any single night in January 2017, 40,056 veterans were experiencing homelessness in the U.S. 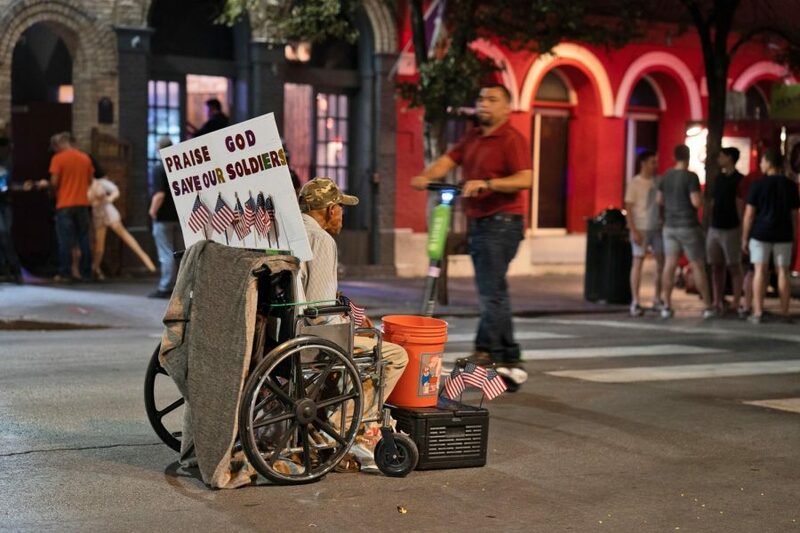 The state estimate for homeless veterans in Texas is 2,200, holding between three and six percent of homeless veterans in the country. So if Trump supporters care so much about veterans, why are they taking to destroying shoes and socks, something that homeless veterans desperately need? It’s simple. It’s because opposition for Kaepernick’s protest doesn’t exist because of veterans; it exists because a black man has been given a platform. It’s an issue of race. People will say they don’t hate Kaepernick because he’s black, but it’s so blatantly obvious that’s why. If it wasn’t, then Trump supporters would be doing more charity work for veterans instead of ignoring them. If you’re truly against Kaepernick’s protest because of veterans, then stop burning your Nike products and donate them. Actually go out and help a homeless person instead of turning your nose up at them. Campus diversity: Is St. Edward’s actually as diverse as it says?